Having said that I’d spend the rest of the year running shorter distances, letting my body recover at its own pace, I appear to have entered a hilly 30k race next Sunday. Oops. The North Downs 30k is run largely on trails and incorporates 500m (a little over 1600ft) of ascent – some of which is perilously steep. With great reviews, stunning scenery, and the promise of finish-line cakes, it’s a race I’m very much looking forward to. However, given distance and hills, my training to date hasn’t been exactly optimal… The furthest I’ve run in training is just shy of 14 miles (22.5k at best) over largely flat tarmac. Even the trails I’ve been running on recently have been predominantly flat. So, setting out at 2pm on Sunday having had a couple of slices of toast and honey, I was aiming for a combination of hilly running and time spent on my feet. Two and a half hours was roughly what I was aiming for, and with hills being the order of the day my best option was to take in Alexandra Palace, Highgate and Hampstead Heath. Alexandra Palace sits on top of a lung-bursting hill when approached from Wood Green, and for good measure on hitting the summit I headed down the paths and trails below and climbed the hill again. With the hills already burning my quads, I set off to Highgate Wood via Woodland Walk. Highgate Wood has a few small-but-steep dirt hills for a bit of added elevation and the comfort of a soft trail underfoot. It’s also quite small, so I was out of the woods shortly after and took a moment at some traffic lights to contemplate the best way to get more height – go straight on to Highgate (a bit of a steep climb, but adds nothing significant) and make up the remainder on Hampstead Heath, or descend to Finsbury Park and then climb back up before hitting Highgate. The latter would mean a more substantial ascent and less time on the heath (which is hilly and muddy, but disappointingly small), which seemed to fit today’s brief. The trail descent through the other stretch of Woodland Walk was crowded with dog walkers, families on bikes and yoofs over-layering each others’ graffiti on the various bridge arches. I took a lap of Finsbury Park and then started the gradual ascent back up the walk. By the time I got back on the road to Highgate, and the short, sharp hill that follows, I was feeling the strain of the hilly terrain. I took the descent past Highgate Cemetary slowly before immediately heading towards Parliament Hill. The path up this hill splits into two sections, with a slight leveling out between. Unable to resist a bit of a flourish as I approached the crowded viewpoint at the top, I put on a final burst of effort, before my legs spontaneously combusted. 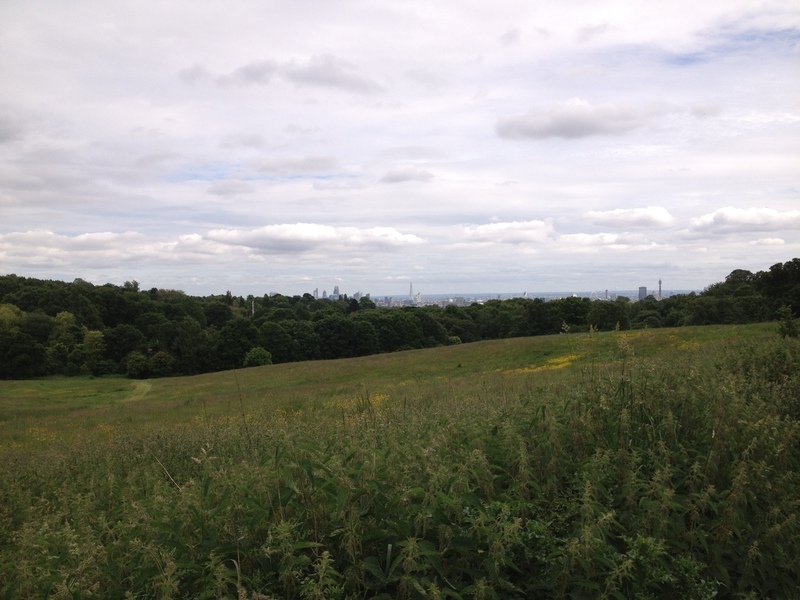 There then followed a bit of downhill/uphill as I wound round a circuit of the Heath, adding a bit more elevation and being rewarded with views over the woods and city beyond. By this stage, my legs were stiffening as the hills and more than two hours running took their toll. Nevertheless, I plodded on, knowing I had one final ascent between me and the long final straight: back up Highgate hill. It was a slow, tortuous climb, but eventually the terrain flattened and it felt less like I was running through treacle. The long wind back down Woodland Walk, across Finsbury Park and through the backstreets to Seven Sisters felt tough. By this stage, I had no idea how far I’d run, or how high I’d climbed. All I could look forward to was a nice sit down. I remembered this feeling from the long marathon runs, and did my best to use the mental strategies that had got me through longer runs in the past. Eventually I arrived home, got in, stopped running, and immediately my legs cramped up. A soak in a hot bath and a hearty spray of Deep Heat helped alleviate some of this. After some food (perhaps not the best day to skip lunch), I checked my Garmin record of the run. Just a smidge over 3 hours of running, covering just a smidge under 22.5 miles (36k) and 1550ft (475m) of ascent. So, the good news is that I’ll be able to stop 3.5 miles sooner next weekend. The bad news is that it’ll be even hillier! Considering that this run broke virtually every rule of increasing distance – you’re meant to increase distance by gradual increments, not in a bit 8.5 mile hit, and ideally you should start the run with a decent volume of complex carbs in your system – the run didn’t go too badly. It wasn’t pain-free, but the vast majority of that pain was the kind of pain I should have been experiencing on that run rather than ankle-based grinding. So, hopefully that should set me up well for a nice leisurely jaunt on the North Downs next week.